SVVU M.F.Sc/ Ph.D. 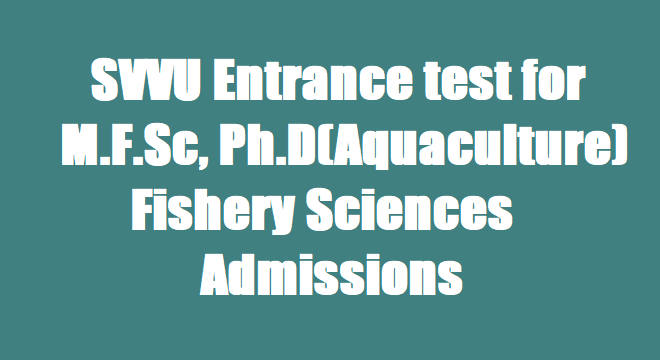 Admissions, M.F.Sc Fishery Sciences Entrance test, Ph.D(Aquaculture ) Entrance Test, Sri Venkateshwara Veterinary University M.F.Sc/ Ph.D. Admissions, M.F.Sc and Ph.D (Aquaculture ) course in Fishery Sciences. Sri Venkateshwara Veterinary University Tirupati has issued admission notification for M.F.Sc/Ph.D. for the Academic year 2017-2018. Applications from eligible candidates are invited for admission into M.F.Sc and Ph.D (Aquaculture ) course in Fishery Sciences for the academic year 2017-2018. For M.F.Sc course, candidates belonging to the state of Andhra Pradesh & Telengana who fulfill the residential requirements of A.P. Educational Institutions Order 1974 (Presidential Order) only are eligible to seek admission. Qualification: B.F.Sc of 4 years duration from state Agricultural Universities. M.F.Sc: The selection of the candidates shall be based on the previous academic record i.e. B.F.Sc (30%) and performance in PG Entrance examination (70%).The entrance test shall be comprehensive one, covering all relevant subjects prescribed for the degree requirements of this University as per ICAR guidelines. The Entrance Examination paper contains only 200 multiple choice questions. The candidates have to mark answers by darkening circles on OMR sheet. The candidates getting 40% or more marks in entrance test only are eligible for admission. However, in case of SC/ST/PH candidates, there are no minimum qualifying marks and candidates are admitted to the extent of seats reserved for them. SC/ST/PH candidates claiming seats under general category have to obtain at least 40% marks in the entrance test. Qualification: M.FSc Qualification in Aquaculture. The qualifying marks in the entrance test shall be 50%. In case of SC/ST/PH candidates, there are no qualifying marks to the extent of seats reserved for them. The entrance test shall consist of 100 multiple choice questions covering Post graduate courses listed in respective discipline with 500 series. The candidates have to mark answers by darkening circles on OMR sheets. The Candidates applying for admission should appear for Entrance test at their own expenses. Information about the qualifying candidates in entrance test will be displayed on University website www.svvu.edu.in on ............2017. Counseling for qualified candidates shall be held on .......................2017 from 10.30 AM at Conference hall, Administrative Office, SVVU, Tirupati. Selected candidates shall have to produce all necessary original Certificates including those of educational qualifications, pay fees and register the courses at College of Fishery Science, Muthukur by the prescribed date. Failure to do so entails forfeiture of claim for seat. In case of a tie, the candidates who secured higher marks at M.F.Sc level shall be preferred. In case of a further tie, the marks obtained at B.F.Sc level shall be considered. For further tie breaking, date of birth shall be considered and older candidates shall be preferred. The applications shall be downloaded from www.svvu.edu.in. The duly filled in application along with attested copies of required certificates and a crossed demand draft for Rs.1000/- towards Registration fee (Rs.500/- in case of SC/ST/PH candidates) drawn on any Nationalized bank favouring “Comptroller, SVVU", payable at Tirupati, should reach the Registrar, SVVU, Administrative Office Dr.Y.S.R.Bhavan, Tirupati - 517 502 on or before 31.07.2017 by 4.00 PM either in person or by Registered Post with Acknowledgement Due. Applications received after this due date will summarily be rejected. Candidates who are in employment should send their applications through proper channel failing which they will be summarily rejected. The University is not responsible for any postal delay.